LowellDavis.net: Having lunch with the boy. Like a boss. My wife is, like almost every woman you ever talk to, watching what she eats. Our meals are delicious but healthy. That's fine most of the time however I can't deal with it every day. Sometimes you just have to eat like a red blooded, sports-loving American male. Chicken wings. And lots of them. Pizza. And lots of it. Anyway, I'm spending the day at home with Holden today instead of going to work. We decided to bypass the steamed broccoli and chicken breasts that have taken over the house in favor of this giant bag of deliciousness. The Daddy/Holden lunch for today: Cheeseburger on a grilled glazed donut. Prep. Busted out the Food Network table top grill for the occasion since the wind chill outside is currently -16 degrees which doesn't lend itself to firing up the grill on the deck. The final product. I'm a little pissed that I forgot to make bacon to put on it and didn't want to take the time to cook bacon once everything else was ready and I finally realized that everything is better with bacon. Mental note for next time has been made. 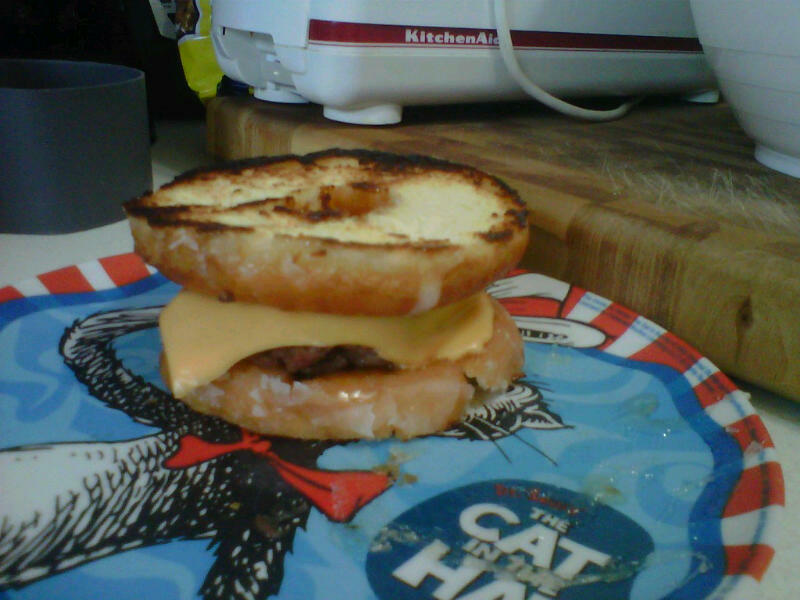 Wow, that honestly is making my cholesterol rise just looking at it. 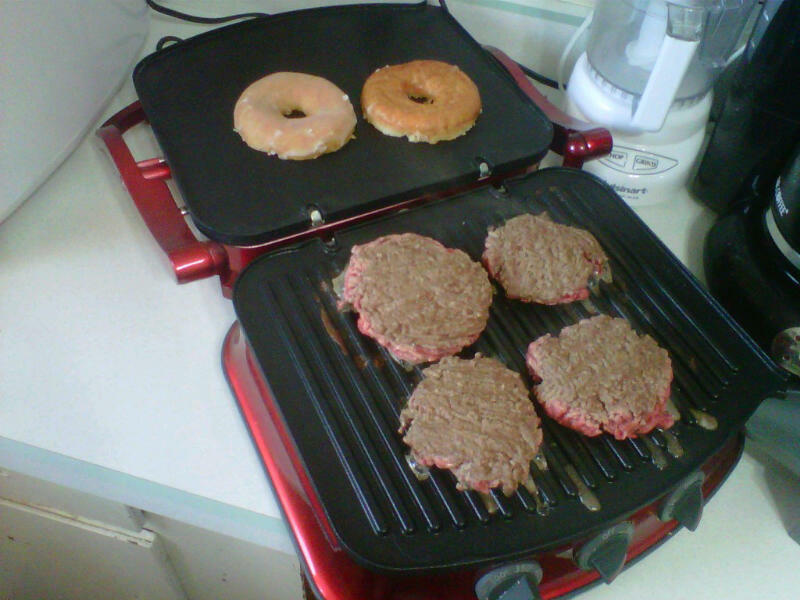 I don't want to tell you how to be a parent however I must point out a recent study that showed children are 436% happier as adults if fed cheeseburgers on grilled donuts in their formative years. Just something to think about. Does the glaze come off of the donuts? Or is it a sweet-and-meat thing? I'm not brave enough to try this.